FREE for infants up to 6 months! Open Enrollment! Families may register and begin attending Little Notes classes at any time. Infants are free up to 6 months. During the early childhood years, birth through age 3, every moment is an opportunity for children to learn. 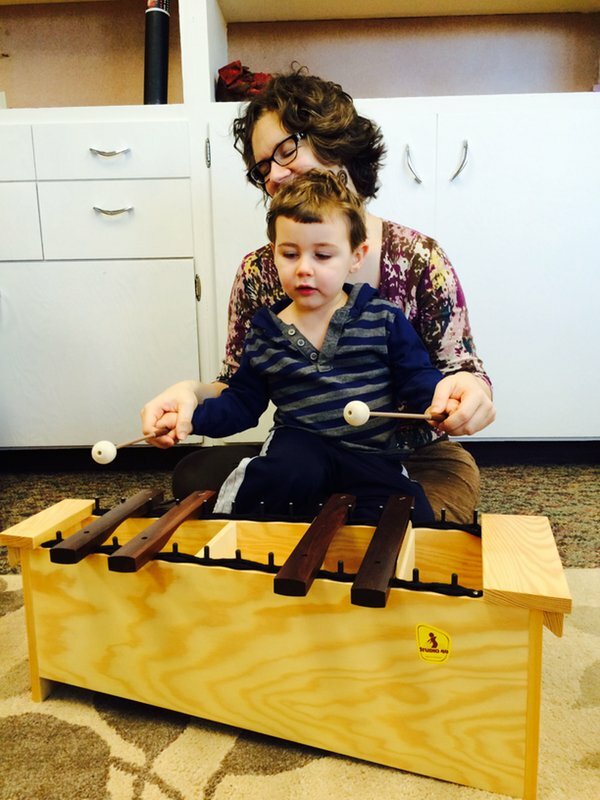 Little Notes uses singing, percussion instruments and repetition to help children 0-3 begin building learning and life skills, have fun and share bonding quality time with a parent or other caregiver. Parent and teacher guide each child in a fun, pressure-free environment. The curriculum consists of nursery rhymes, circle songs and story songs, plus reading aloud at the end of each class. Each class has a maximum of 10 families. No prior musical training is necessary. Plus, unlike many other early childhood programs, there are no new CDs to buy or new songs to learn every few months. Little Notes uses the same songs throughout the entire class, giving you familiar songs and rhymes that you can share with your child for years to come. Head Teacher (and mom) Jodie St. Clair is a registered Suzuki Violin Teacher. She received Suzuki Early Childhood Education (SECE) training from Dorothy Jones, founder of the Suzuki ECE program and the World Centre for Suzuki ECE Teacher Training. Jodie has also taught the SECE class at the 16th Suzuki Method World Convention, held in 2013 in Matsumoto, Japan, birthplace of the Suzuki Method. Assistant Teacher Jenny Mendoza is a doctoral student in developmental psychology at the University of Oregon. With a focus on music, Jenny’s research explores how infants learn to process sounds in their environments. Working with Little Notes combines Jenny’s loves of music, working with young children and families, and early childhood education. In the Suzuki Method, children thrive in an environment of total support. Suzuki students develop confidence and self-esteem, determination to try difficult things, self-discipline, and concentration. They also acquire a lasting enjoyment of music, and the sensitivity and skills necessary for making music. In Japan in 1985, Dr. Shinichi Suzuki, founder of the Suzuki Method, asked Dorothy Jones to develop a Suzuki ECE program. Dorothy Jones is a Registered Suzuki Association of the Americas (SAA) Teacher Trainer, Past-President of the SAA, 10-year Board Member of the International Suzuki Association (ISA), and founding member of the Board of Directors and Past-President of the Suzuki Association of Ontario (SAO), Canada. In 1993, Dr. Suzuki and the Board of Directors of the ISA approved the curriculum Dorothy Jones developed and named her school in London, Ontario, Canada, as the first World Centre for Suzuki ECE Teacher Training. Check out our Little Notes FAQ or contact us for more information.